This meal was absolutely delicious. 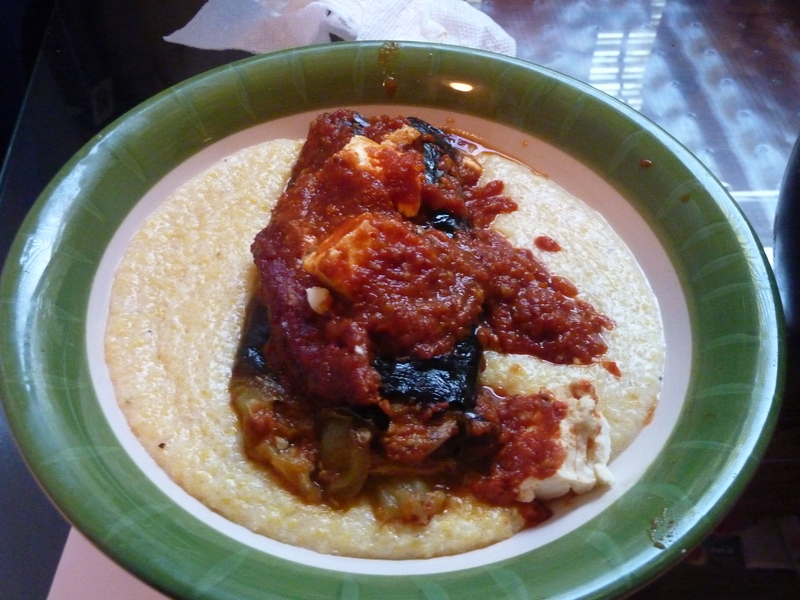 The chipotle sauce, which was incredibly spicy, was balanced out perfectly by the richness of the beans and creaminess of the polenta. If you don’t like your food super hot like Zak and I do, add an extra tomato and remove a chipotle or some adobo sauce from the recipe below. I thought it was absolutely perfect though, and served this with a large dollop of sour cream and some of Zak’s homemade guacamole. The quickness and ease of this recipe really belied the huge explosion of flavors in every bite. Preheat broiler. Cover a baking sheet with tinfoil and spray liberally with cooking spray. Place cubanelles on baking sheet and spray with cooking spray. Broil approximately 15 minutes, turning with tongs once or twice to ensure even broiling. Remove peppers from broiler and place immediately into a plastic zip lock bag to cool. After cooled, remove seeds and ribs. If desired, remove charred outer skin. I left it on because I enjoy the smoky flavor. Combine shredded pork, refried beans, and Mexican cheese. Slice cubanelles lengthwise and stuff with shredded pork mixture. Place seam side down in a casserole dish sprayed with cooking spray. Smother with chipotle sauce (recipe follows) and cover casserole with tinfoil. Bake, covered, for 25 minutes. Remove tinfoil and add feta cheese. Bake another 15 minutes until heated through. Meanwhile, make creamy polenta. Serve cubanelles and chipotle sauce over creamy polenta. In a medium saucepan, heat olive oil over medium heat. Add onion and garlic and sauté until onion is soft and translucent. Transfer mixture to food processor. Add tomato paste, chipotles, adobo sauce and tomato. Pulse until smooth consistency is reached. Pour over peppers before baking. See recipe for Tomato and Wine Braised Short Ribs with Creamy Polenta, “creamy polenta” portion. For this recipe, I used Homemade Beef Stock. While on a river walk with the dog on Sunday, Zak and I found some wild mint growing on a little island in the river. It inspired us to make some mojitos. Sadly for us, the laws in Ohio are as such that we were unable to purchase the rum necessary to complete those mojitos the day we found the mint. 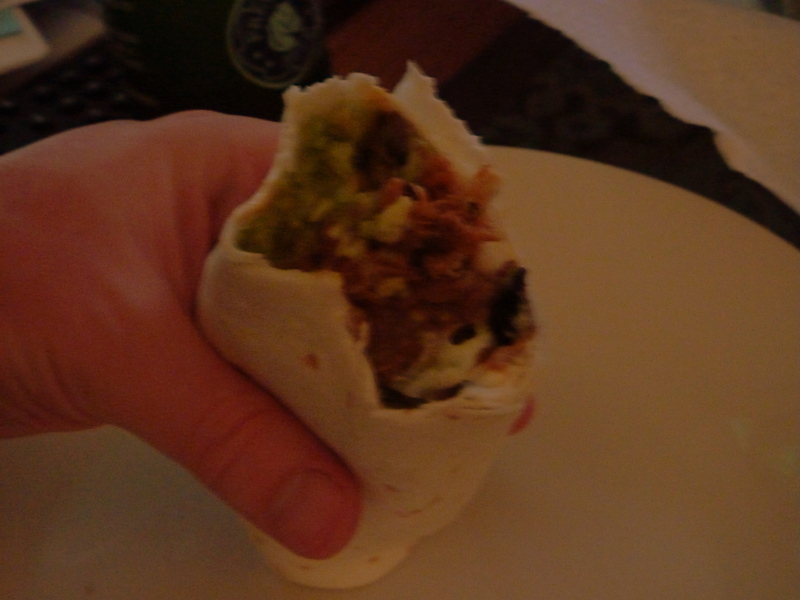 Nonetheless, that mint inspired this build-your-own burrito feast we had last night. The pork turned out absolutely delicious and this was a really yummy, filling meal that went great with the mojitos. Place all ingredients in a covered saucepan and simmer over medium-low heat, covered, roughly 1 hour or until most of liquid is evaporated. Using two forks, occasionally shred the pork and chilies until completely shredded. Combine all ingredients in a food processor and blend until desired consistency. Layer all ingredients to taste in the tortilla and enjoy!